Hugh Baron Fraser was born in Inverness in April 1784, the son of Hugh Fraser and Mary Codd [OPR Births 098/00 0050 0105] who had married in Edinburgh in 1781 [OPR Marriages 685/02 0088 St Cuthbert's]. Hugh snr was a merchant and Mary was the daughter of Philip Codd, quartermaster of the 93rd Regiment of Foot. Her brother, Philip (1763-1831), became a clerk in the War Office, where he served for 28 years before being retired in 1822. He may have assisted in advancing Hugh Baron Fraser’s career in government service. At the age of sixteen Hugh Baron Fraser was sent to train for a year with Reuben Cox, a merchant in Deptford, London [Will of H B Fraser PROB 11/1697]. 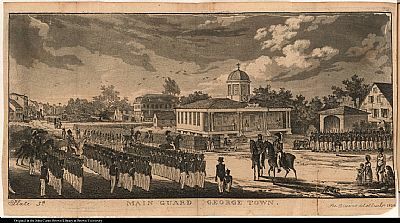 He was appointed to the government post of Civil Commissary of Demerara in, or before, 1812 and served in this post until 1824. He returned to Britain in the ship Colville, which was wrecked on Chesil Beach in a storm on 23 Nov 1824, with the loss of all crew and passengers. His body was placed in a common grave at Portland with other victims but in December, on the instructions of his cousin Philip Codd, the grave was opened and his body re-buried in the church. At his death [Will of H B Fraser PROB 11/1697] he owned a property in Cumingburgh (Lot 161, North Cumingsburg, Georgetown, Demerara) and over £31,000 was in the hands of his agents in London and Liverpool. 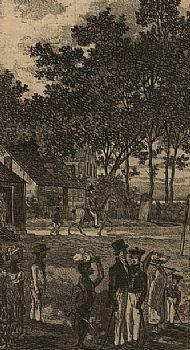 He left £4000 each to his two children, John and Shirley Fraser, whose mother was an Elizabeth Le Blair in Demerara; and 12,000 guilders to two mulatto children, Mary and James, who had been purchased by him from Mr Cort of Plantation Eendraght, with instructions that they be manumitted. John and Shirley also received nine slaves, and Mary and James six. The Cumingsburg property was divided between the two sets of children. The money left to John and Shirley was to be invested in British funds, perhaps suggesting that they might have a future in Britain, unlike Mary and James who were born slaves. Shirley Elizabeth did, indeed, move to Lambeth, Surrey, where she died in 1845. Fraser also left money to his sister, his cousins (Hugh Fraser at Canefield, Leguan Island, Essequibo and his two brothers and a sister near Inverness), to his aunt (Catherine Wishart, Kirkhill, near Inverness), to his cousin Philip Codd and a small bequest to the merchant Reuben Cox.